A bumper £241.66 was received, which included some payments I expected in December. 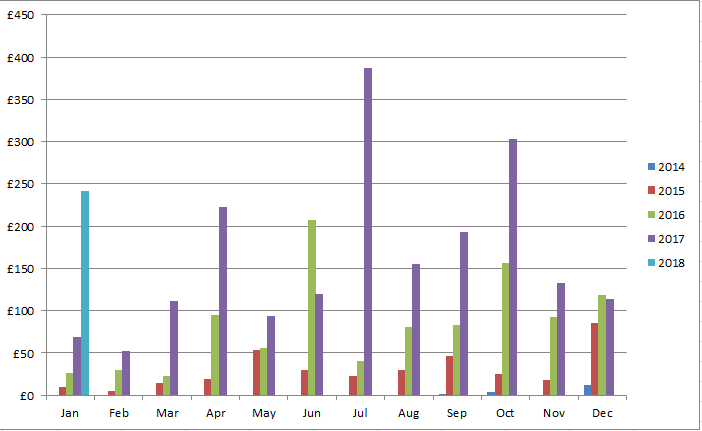 A great start to the year, particularly as January has always been one of the lower paid months. This sum would easily cover my council tax and a couple of my utility bills. A better month than December but not one of my great ones. I made a profit of £170. Had an ok run on the horses but again, the no-lay accumulators (accas) didn’t go my way. For those interested in stats, I did 48 no-lays, which resulted in a 25% win rate and 48% loss rate (12 wins, 23 losses, 13 acca insurance) resulting in an acca loss of around £9, which actually isn’t bad as at one point, I was over £100 down! The no-lay acca strategy is a long-term (and slightly risky) one. It’s only the first month but I hope there will be better ones! The matched betting guide I subscribe to is OddsMonkey*. It’s an excellent little website for beginners and experienced matched bettors alike – for beginners, there are plenty of tutorials which provide you with step-by-step guides on how to make profits and to work through special offers. They also offer one-to-one sessions for those who need a little more help. OddsMonkey offers quality tools including the Each Way Matcher, Extra Place Matcher, Dutch Finder, Racing Matcher and Acca Matcher. There’s also a friendly forum for you to ask questions. Anyway, check out the free trial*. For those interested, you can also see how I’m getting on with my Book Bingo here – I’ve crossed off some squares! One consequence of turning down social events in January is that I now have a pretty full calendar in February, with dates in March filling up too. I had to put off my hair appointment for frugal January – I’m relieved to say that I’m going to the hairdresser this weekend for a belated appointment and no longer have to attempt combing and parting my hair in a Trump-like way to hide some of my grey! Actually, that sounds far worse than it actually looked, haha! So on that hideous note, hope you all had a great January and have a great weekend! This entry was posted in Books, Dividend Investing, Earnings, Expenses, Investment Trusts, matched betting, Portfolio, premium bonds, Savings, Shares by weenie. Bookmark the permalink. You’re right, it’s about finding the right balance. For most, the journey to FI is shorter than you think but longer than you want it to be. I find that I need to enjoy the journey just as much as looking forward to the destination. Being frugal to the extent that it removes everything I enjoy in life (love my Nando’s) just isn’t fun for me. Yes, as with most things, there’s got to be balance. I know I could advance towards my goals a lot quicker but I feel that I should sacrifice anything to get there, including happiness. I try and drink quite heavily in January as a rule. This January was no exception. I did abstain from all news media for the month and that was a big win. Fully recommend it. Hi The Rhino. Out of interest, are you the same person who recently commented on a TEA article? If you are, then I just want to say I agree with your observation about critical posts. It’s a shame it didn’t see the light of day. 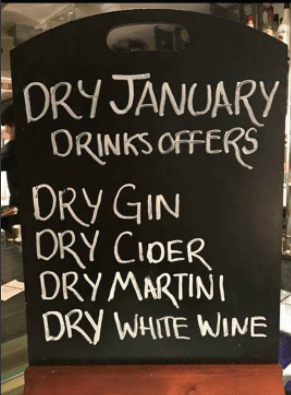 Haha – yes, think I’ll have a dry February. Abstain from all TEA consumption. Research suggests it can significantly lower blood pressure? In the same way athletes need to know their lactate threshold, FI ers need to know their frugalista threshold. The point beyond which things become painful. I usually have at least a couple of blog free days (ie no reading of any FI blogs) each week; haven’t tried abstaining from all news media – not felt the need to do so, although I’ve been avoiding reading all the hysteria about stockmarket crashing this past week! All the best with the rehab. I have lived extremely frugally in the past, but always made room for the occasional treat or luxurt. Now, I always make sure I have something new to look forward to so that I keep things fresh and interesting. It sounds like you have a good balance, Weenie. Thanks Chris. Funnily enough, one of my friends (after being paid) had been out shopping to ‘treat herself’ with some new clothes. I paused and thought ‘do I need to treat myself like that?’ and the answer was no. However, I have been more ‘liberal’ with my food shopping this month so far and am looking forward to my social outings! Hi Weenie, totally agree with you – life’s way too short for a dry January! I also like your observations on how being too frugal can be a fairly flat and joyless existence. I often reflect that years of serious saving has almost made me forget how much fun and satisfying spending a bit of spare cash on yourself and others can be. I don’t envy people who can blow their wage packet every week, but I do envy their attitude (a bit)! Good to see how well you’re doing though, keep it going. It’s like the gag about vegetarians..
Haha, nice one! I actually have a mostly vegetarian diet during the week (just easy to cook veggie meals after work or after the gym) but tend to make up for it at weekends by having a ‘meat fest’, eg roasts, ribs etc. I don’t think I could ever give up meat totally and definitely not bacon! Cheers Jim. I do admire how some bloggers are extremely frugal and seem to be quite happy being so but it’s not for me. I think I will be a bit like you, kind of reluctant to splash the cash when the time comes! Congrats on beating your savings rate target. Cheers HoSimpson and haha! 😉 Speaking of drinking problems, I know a couple of people (men and women) who regularly polish off a bottle of wine on their own in one night during the week – firstly, how on earth do they get up the next day to go to work and secondly, how much do they drink at weekends? Congrats on the savings rate and the dividend haul! I do agree that it’s all about balance. There’s no point in having a savings rate of 50% plus if you’re not enjoying life. I think dry Jan is a bit of a waste of time to be honest. Many just seem to over indulge come February. It’s been proven that a small amount of alcohol regularly is much better for your body than going without for a period of time and then consuming a lot. I hope the trip to the hair dresser went well. Yep, I too think dry Jan is a waste of time – I’ve heard people at work talking about just getting absolutely wasted that first Feb weekend to make up for lost time! All in moderation, which is what I practice (mostly)! Hair appointment went well thanks, no more dodgy parting required haha! Yay! Congratulations on starting 2018 with a savings rate above your goal 🙂 I hope you’ll manage to keep it up despite being more social – but then again, enjoying life and social events is probably more important. Thanks Carl – it is a great start to the year. Feb won’t be so great savings rate wise but shouldn’t be far off. However, I’m in a happier place this month! Dry January?! Why torture yourself, although I am impressed with 3 days! I don’t see any point in giving up something I enjoy! It is so good (sorry!) to hear that I am not alone on the not adopting the ultra frugal lifestyle – I just can’t cope! Having said that when you see an almost 60% savings rate that has to feel good! Just out of interest, for your SIPP savings, is the £50 including the tax rebate or just the net you put in? You have to enjoy this life – you don’t know when it will come to an end so whilst I don’t go for YOLO – at least get the right balance. I would love to be FI right now but I want a certain lifestyle so I put up with it! The near 60% savings rate did feel great but I feel better that I’m leading a more ‘normal’ life this month. I think I tend to be naturally on the frugal side anyway but I just took it a bit too far. The £50 going into my SIPP is the net I’ve put in, the £12.50 rebate just gets reclaimed the month after by my platform. 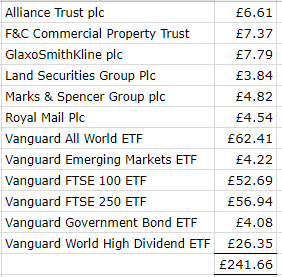 So yeah, I guess in total, it’s really £62.50 going in my SIPP but I’ve never included such tax rebates in my numbers, it’s just all rolled into the total. Full on YOLO scares me but a bit of it doesn’t do any harm so I can enjoy my life right now whilst keeping an eye on the future! Yes, there is only so often you can do the maximum “monk/nun style” life – you need to have some enjoyment! Thanks for the clarifying your SIPP contributions – you take the same approach as I do, but think of the benefit, it means any forecast you do is actually going to be a little on the cautious side as you are putting more in! Spot on with the YOLO, the balance again! Hey Weenie, curious as to why you decided to have the Frugal January in the first place. I’m guessing this isn’t something you’ve tried before? It’s the kind of thing that I would like to try, but Mr. ETT would have an extreme reaction if I were to even suggest it! Looks like I’m in the minority of not only doing Dry January (which isn’t actually a thing in Australia), but committing to a Dry 2018. You’re all good because you don’t drink during the week. I just came across this article that makes mid-week drinking actually sound pretty scary! I decided to have a frugal Jan partly because of December excesses, in terms of spending and eating/drinking out and too much. I’ve previously tried months where I’ve followed food/grocery budgets and also social-event-free months, but just not at the same time – I think this is where it got a bit much – I wasn’t going out or eating out and was stuck at home on basic (though healthy) food, no treats. Imagine if I was attempting dry Jan too! What I might try in the future s just the occasional frugal week which should be manageable and not cause too much disruption to my enjoyment of life. Good luck with dry 2018 – I’m not sure that’s something I would ever do or attempt. I don’t miss drinking during the week – I was out last night with colleagues including my boss from the US – they were all knocking back cocktails and I was glad I could just nurse my diet Coke as I was driving! Well done on your savings rate target! Everything seems to be coming together nicely 🙂 I don’t do Dry January but after looking at our expenses I think maybe we should do Dry 2018 in my house! Thanks LMS – yes, coming together at the start of the year but still 11 months to go where things may not go to plan. I have family coming to stay at some point so normal routine just goes out of the window! Dry anything is tough – moderation is key! I’ve just been catching up on the last few posts on your blog. Great to see the goals you’ve set for 2018 and your progress update for January. Wow I can’t believe you saved 59.3%, that’s fantastic. Though I quite agree with you (and many of the comments above) that it’s important to get the right balance between saving and living in the now. Even if you don’t do another frugal month this year, this will have given you a great kick-start to 2018 and psychologically I think that will make you feel great. I’m just getting back into matched betting this year after not doing it for about 6 months. I like the promise of the gains that come from it, but I dislike how much concentration I have to use to make sure I don’t make mistakes. I definitely plan to set myself a decent charity goal this year – and twinned toilets its on my list of charities to consider thanks to reading about it in your posts. I also like the idea of kiva so I’m going to look into that as well. All the best for 2018, I will definitely be following along! Corinna at inspiringlifedesign.com recently posted…Dreaming Of F.I.R.E. I think if I do have to do another frugal month, at least I’ll know what to expect, so perhaps next time won’t be quite so bad! 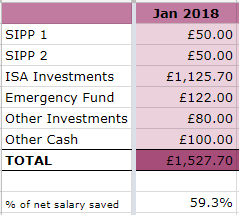 The high savings rate was a great start to the year for me, and will make up for the next couple of months which will have some higher spending. Matched betting isn’t looking great for me this month – missed a couple of weekends so very much behind on my target. Am kind of regretting setting such a high goal but will keep aiming for it. I see you have a blog so I shall nip over to check it out at some point. Thanks for the kind wishes and thanks for stopping by!